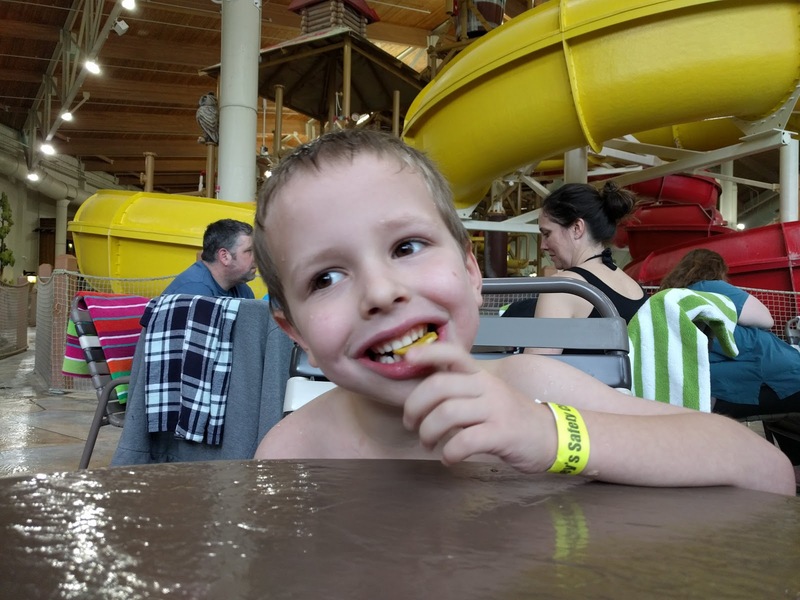 For Christmas, we wanted to give Jared a trip to a theme park or water park. 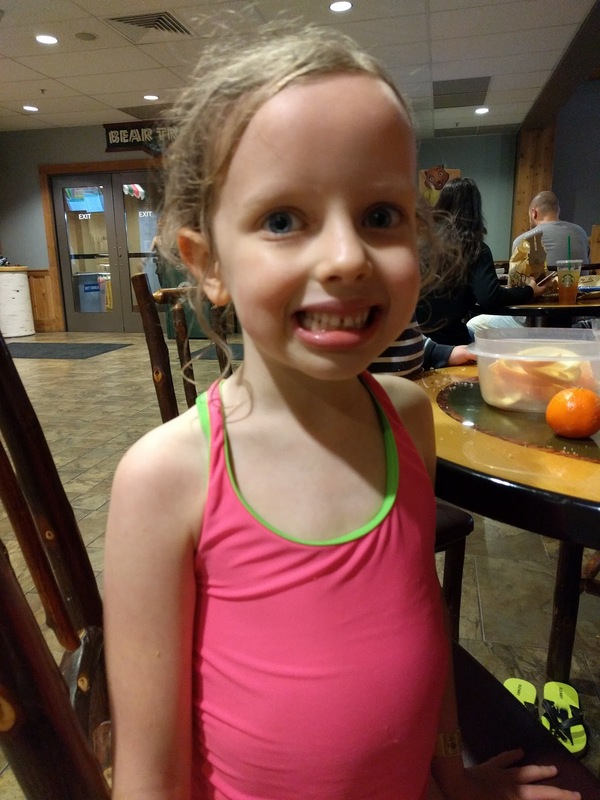 Eloise asked for her gift to be a night in a hotel with a swimming pool. 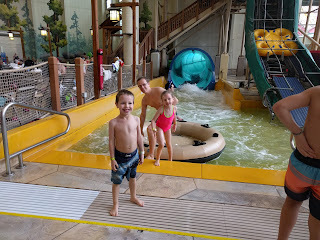 In the end we decided to combine their gifts into one big family trip to Great Wolf Lodge, which is a water park and hotel a couple of hours from our house. They have more attractions than just the water park, but we just came for the swimming. Everyone was delighted to get wolf ears at check in. 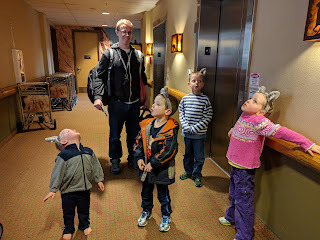 There was a lot of howling in our room. We could play in the water park starting at 1:00 p.m. on the day of check in. We arrived a little after one on Thursday and got right down to business. Sammy never wanted to do a water slide. 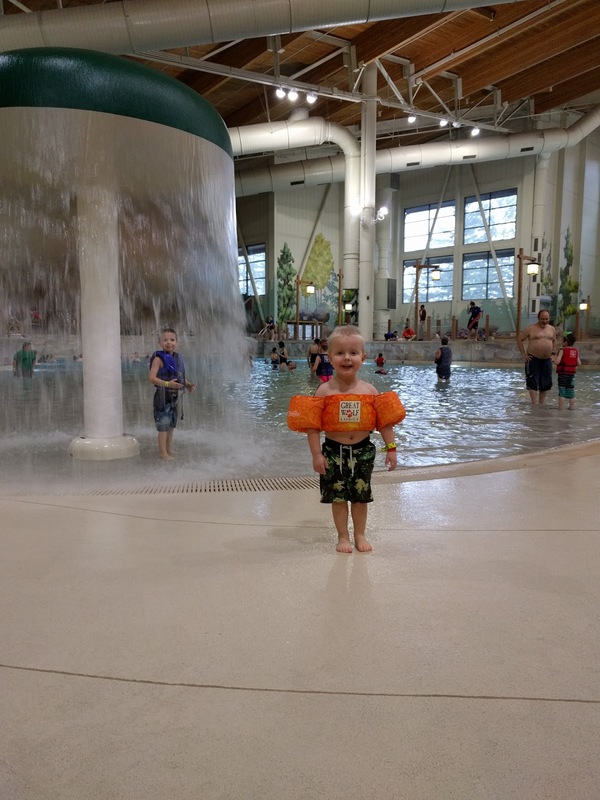 I thought he might warm up to slides eventually, since he is tall enough to go down a few of them, but he never did. He only went down one short playground height one in the toddler area once. Eloise had to warm up to the slides, but once she got comfortable, she was more independent than I have ever seen her, running back up the stairs to do slides over and over and over. 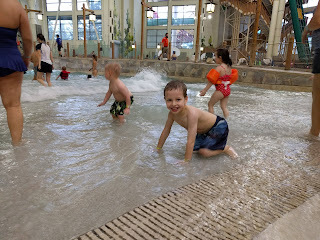 The water park had a wave pool. B and Sammy spent a lot of time playing in shallow water. 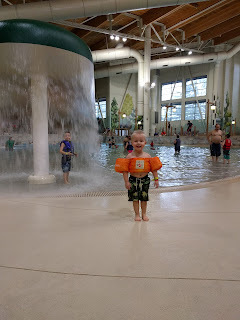 Jared was all about the slides, most of the time, but he also liked playing in the deeper part of the wave pool. 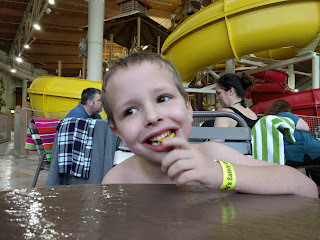 B liked the slides, but didn't want to be going up and down all of the time. After a couple of hours of playing, we went to our room to get cleaned up. "Mega Mind" was on TV, so, after we got everyone cleaned up and put in pajamas, Todd went out to pick up dinner while we relaxed with a movie. 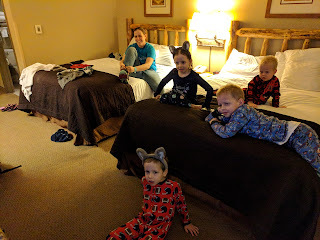 This was the most painless night we have ever spent in a hotel. 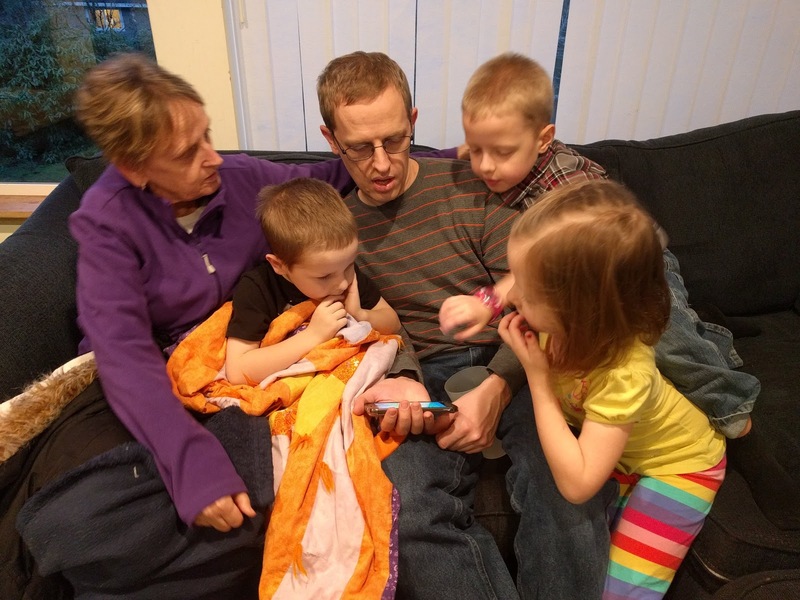 B and Sammy shared a pull out couch, and Jared and Eloise shared a queen bed. No one burst into noisy tears as everyone else was falling asleep, and everyone was asleep before 9:00. 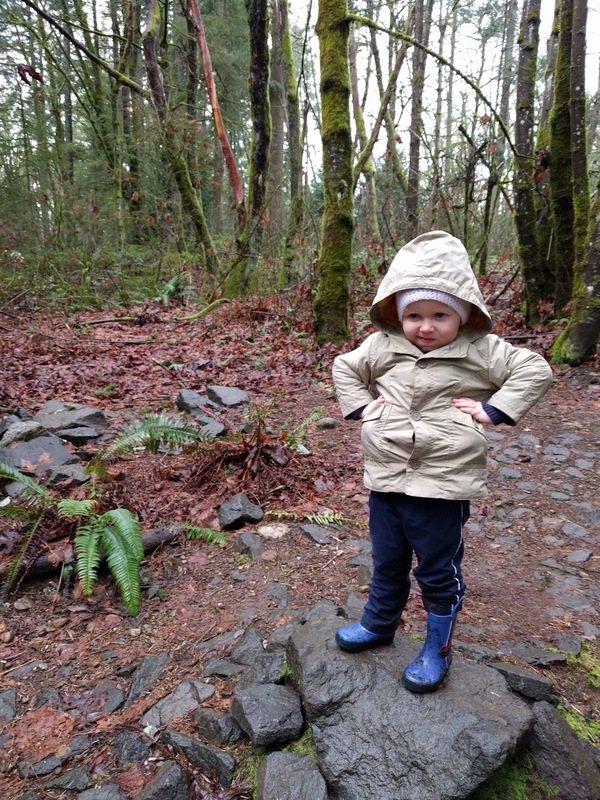 Maybe it is time to try camping again. 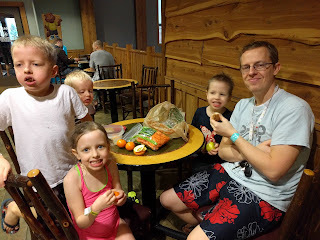 On Friday, when the water park opened at 9 a.m. we were ready to go. These tireless kids swam for FIVE HOURS. Jared dragged me onto a water slide called the Howling Tornado that plunges you into darkness and then drops you over a cliff. It was the scariest thing ever. Jared was in heaven. He was the only one of our kids tall enough to do that particular slide, which just added to the fun for him, I think. 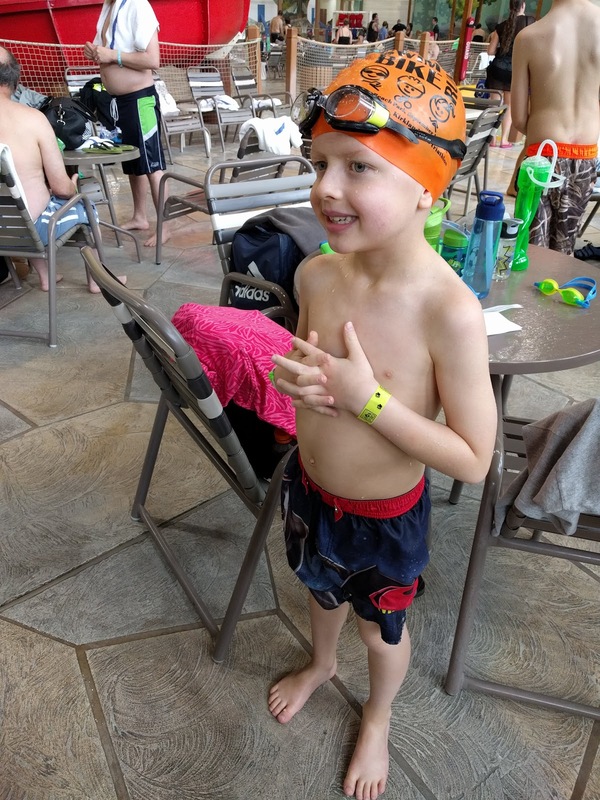 We make him wear this orange swim cap so that we can find him in a crowded swimming pool. 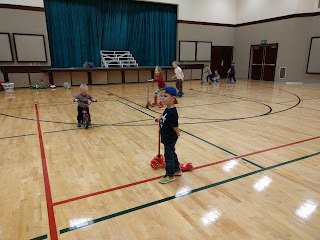 Sammy climbed on the play jet skis in the toddler area and announced that he was going to drive his boat to Arizona. 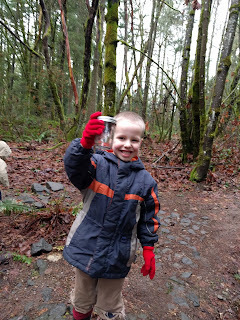 I wonder what he is going to do when he runs out of water on the trip. We had to take a couple of breaks. It was a lovely 85 degrees in the pool area, so the kids didn't get too shivery. 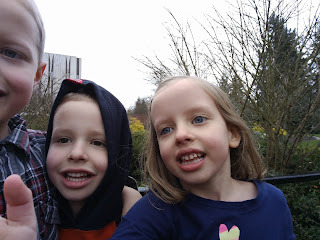 Even when we went outside for lunch we weren't freezing. 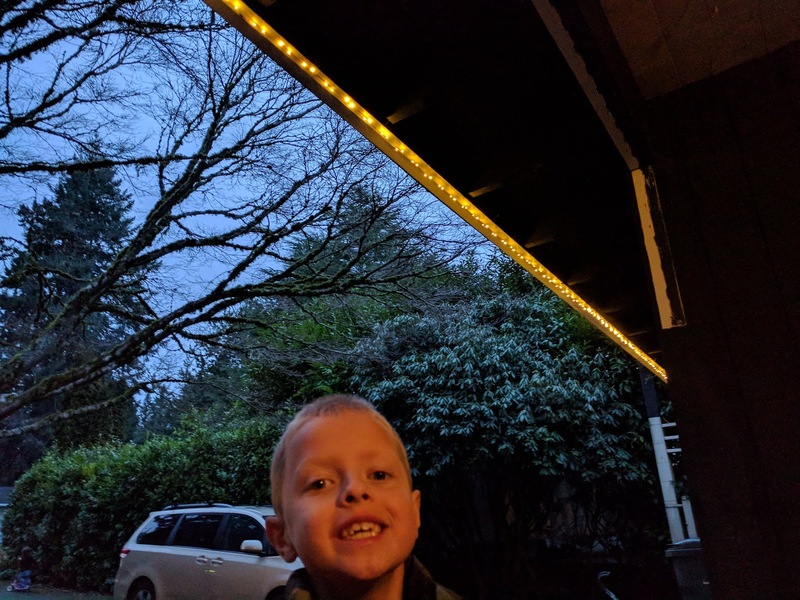 It was sleeting outside, so this was a nice change for us. When we finally left the pool around 2:30, the kids were tired, but happy. 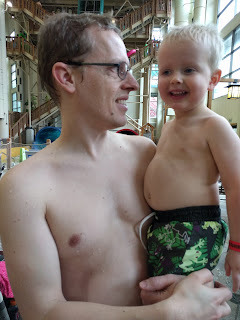 Sammy almost fell asleep in my arms as we waited for Eloise to come down the water slide for the 20th time, and for B to take Daddy on one last run on the tube slides. Sammy fell asleep the minute he was strapped into his car seat, and slept for most of the ride home. He woke up happy at our stop to pick up pizza. In spite of his two hour late afternoon nap, he still went to bed on time and slept late in the morning. All of the kids slept past their usual wake up times the next morning. Pardon my crazy swimming hair. This was the best Christmas present idea ever. I have a feeling I know what the kids are going to be asking for for their birthdays, and for Christmas next year. A week ago, a neighbor gave us a flannel board and some flannel dolls, clothes, and accessories to play with. The kids all love the dolls, but they are all girls, and I knew that B would get a lot more mileage out of some flannel cars. 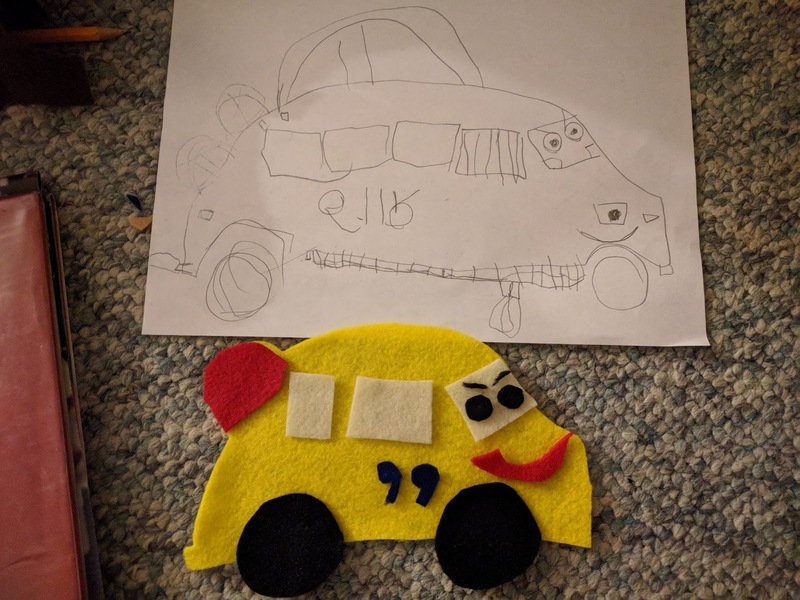 B draws and doodles race cars all day long, so Eloise and I set out to turn some of his drawings into toys. B is a really good artist for a five year old. His cars all have very expressive faces. 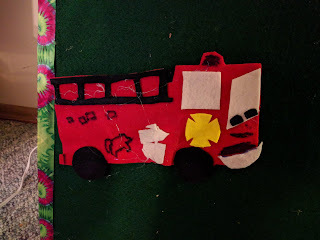 Sammy asked for a fire truck, and even helped us cut out some of the pieces. Eloise cut out a fireman and made him some clothes and a hat. B has designed a pickup truck for me to cut out next, and Eloise has started cutting out word bubbles to put next to the dolls, and decorating them with markers. 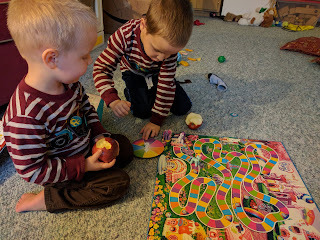 I love seeing their creativity, and the pride they feel when they are playing with a toy that they have designed, or even created from beginning to end. 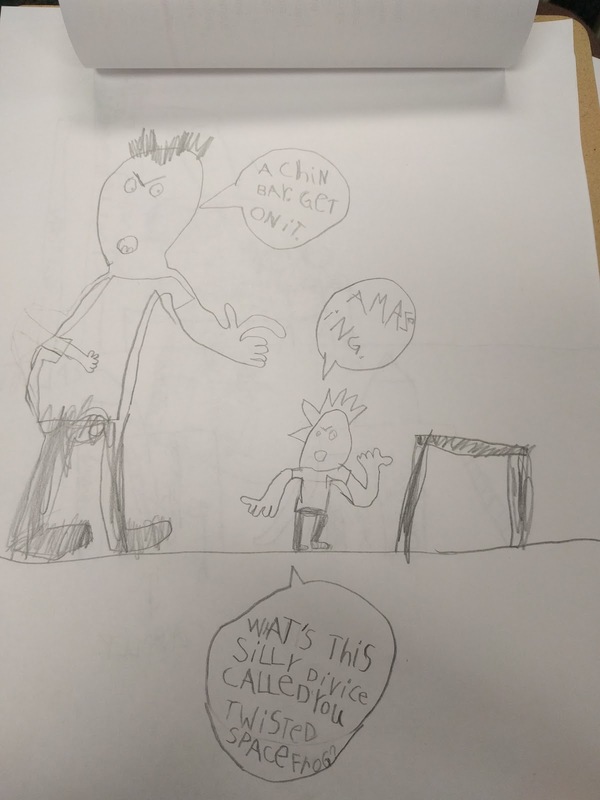 B is really a great little artist. We inherited this stuffed bear from my sister, Faith, because it was in a tote that had my name on it, but turned out to be full of Faith and Cheyenne's stuff. 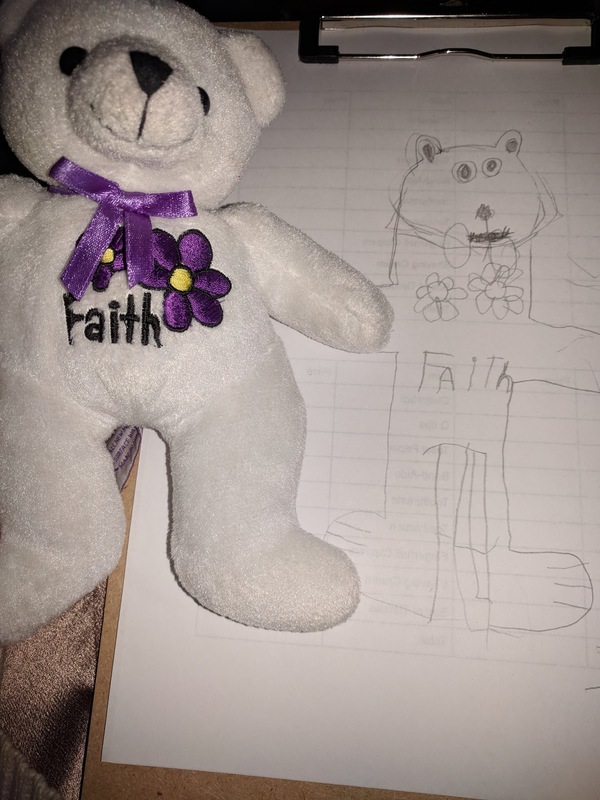 When my mom gave it to me around six years ago, my kids appropriated Faith's bear collection. 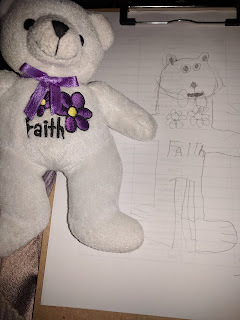 B decided today that he wants to keep the bear, so he drew Faith a replica, hoping to make an exchange. We got a new pet! Meet Tarantuly, who we caught in our downstairs bathroom. 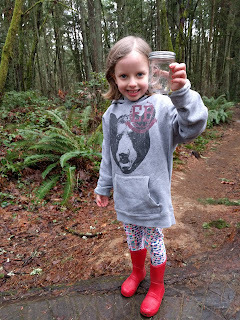 I thought we would observe and release him, but he was so beloved that his jar was carried around all afternoon. 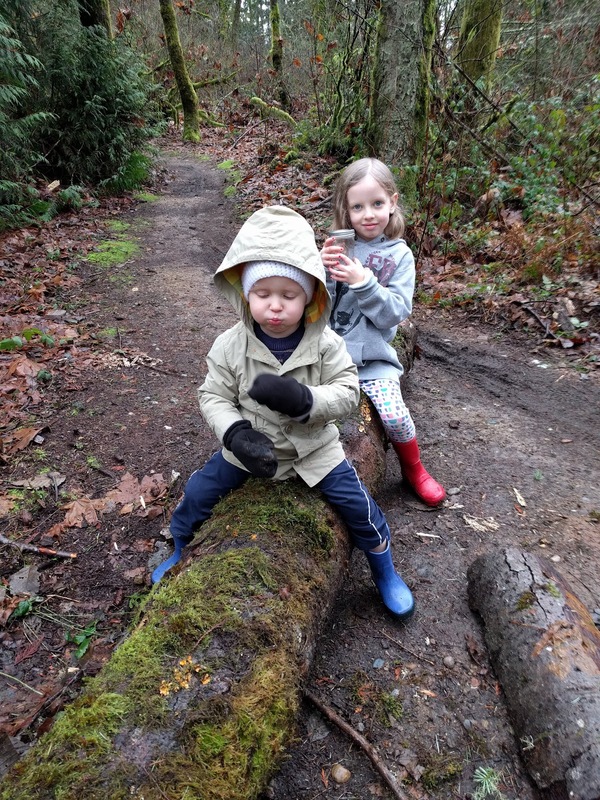 Eloise even brought him with us on our walk through the woods. We went in the woods to break in the new hiking boots Todd and I got on a date yesterday morning. Or it would have been a date if Sammy hadn't had babysitter anxiety. 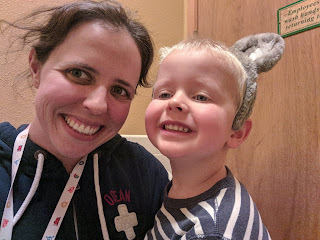 Having a potty training two year old along on a date is a real mood killer, not to mention how difficult it is to have a conversation when there is a toddler pulling on your arm, asking for snacks, or disappearing from view constantly. At least we ended up with the shoes we set out for. "Eloise! Get in my boat! We're going to Arizona!" 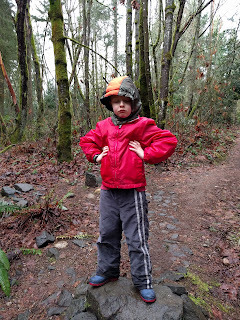 Sammy announced that he was king of the rock, and then did this look. The fat mittens shoved in his pockets gave him wide hips, so we decided he was actually the sassy mama of the rock. Jared kills me with his fashion. He didn't want the puffy coat that goes with this hood, but he couldn't find his hooded rain coat, either, and the clouds were looking ominous, so he just decided to take the best parts of the two coats and combine them. He also wanted to be the sassy mama of the rock. 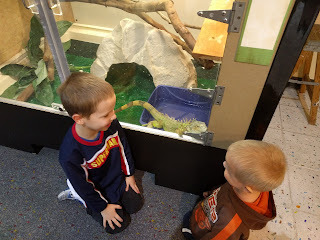 Everyone took turns adoring our new pet and throwing sticks for our old pet to chase. I did insist that Tarantuly get released before bed, since it would be cruel to keep him overnight without feeding him. 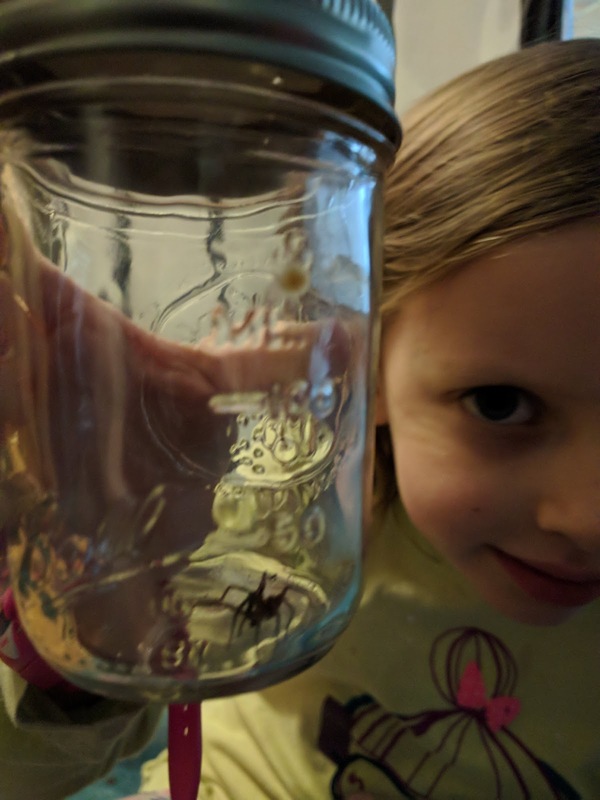 Eloise was concerned about releasing him outdoors, since he is an indoor spider, so he was released into the sheltered porch where Shadow sleeps off of the kitchen. 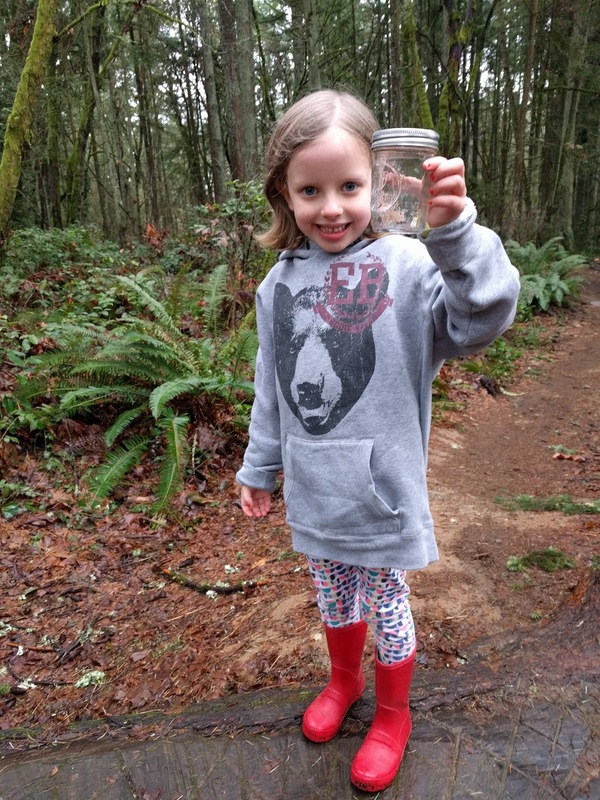 After all of the manhandling he got, I was sure he would flee the jar at the first opportunity, but apparently he liked all of the attention, and refused to leave the jar. 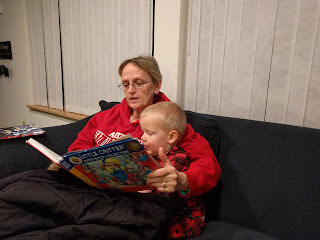 At bedtime, B told me that he is going to miss Tarantuly, but we can find another big spider in the house and name him Tarantuly, too, and then they can be twins. Yep. That is exactly how it works. We wanted to go to the zoo last week, and Monday was the only day without torrential rain in the forecast, so we went right after school (10:05 a.m.) so that we could be back in time for piano lessons. 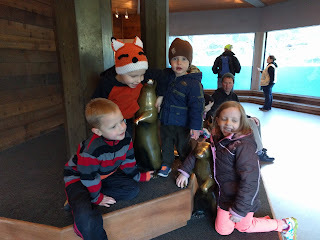 It was warmer than last time we were at the zoo, and the animals were very active. 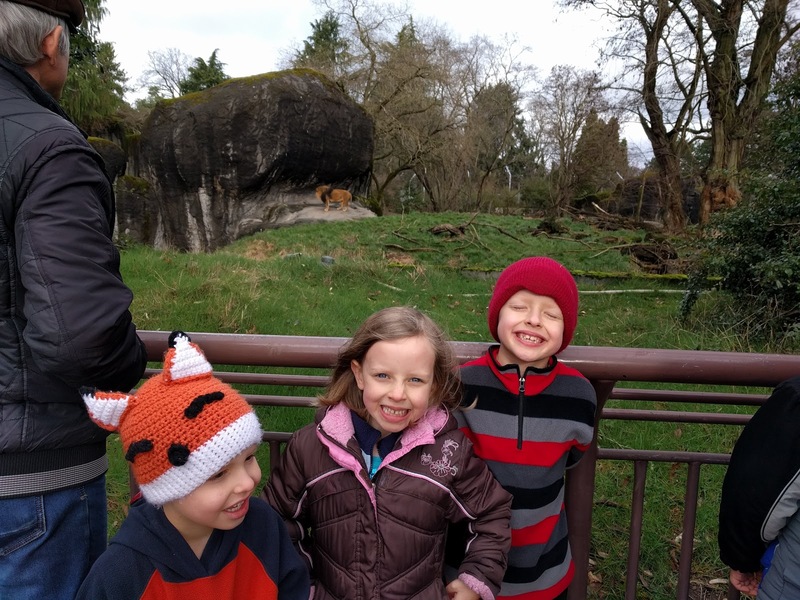 There is a male lion pacing around in the background of this photo. He was making all kinds of noise. 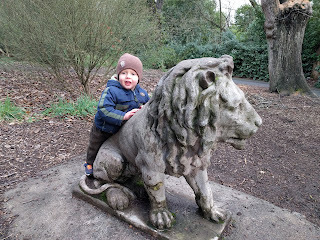 Sammy's infatuation with statuary continues. 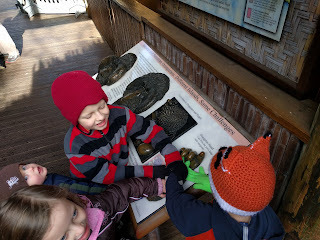 All of the kids could fit their hands into this orangutan hand print. They are huge! 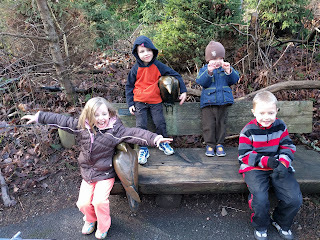 I guess the statuary is easier to photograph than actual moving animals. We don't often make it down the Northern Trail path at the zoo, but the otters are so fun to watch that they make it worth the trek. My moving subjects aren't always very cooperative. I'm surprised that Jared was willing to get this close to this mean old peacock. 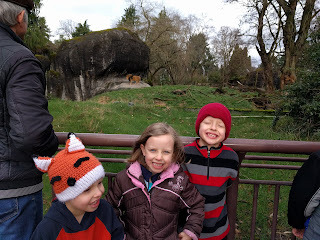 This was a good zoo day. The kids walked and walked and walked without any complaints. It helped that it wasn't raining, for a change. 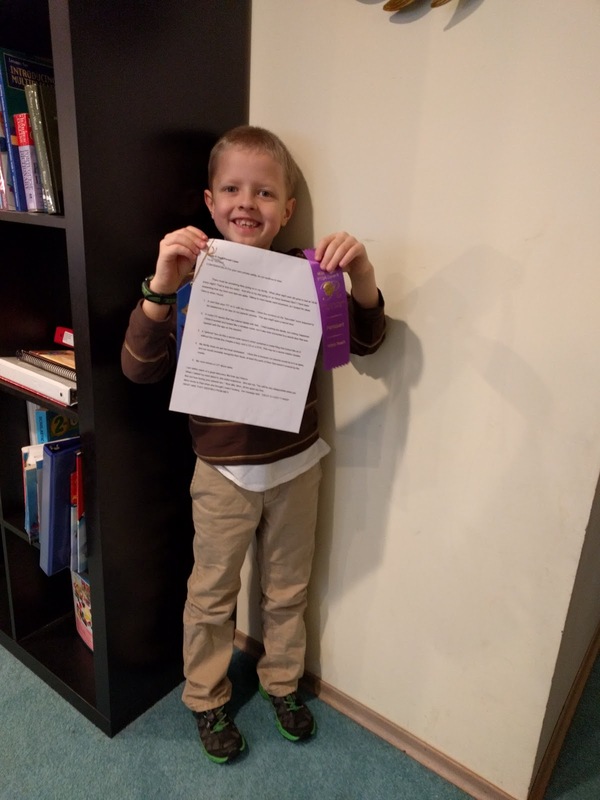 The kids got back their reflections entries and ribbons. It was so fun to get an award for their creativity. They are already looking forward to next year's contest. Jared only had two days of school this week. Because of parent-teacher conferences, the school had a half day schedule, so Jared's classes with the special teachers were cancelled. We took advantage of our break to cash in Jared and Eloise's Christmas presents: a trip to Great Wolf Lodge. It has been so warm for January! As you can see, there is some difference of opinion among us about how to dress appropriately for this 45-51 degree weather. I must say I'm more in Eloise's camp than Benjamin's here. Sammy and Grandpa spent a lot of time bonding over funny cat and goat videos. 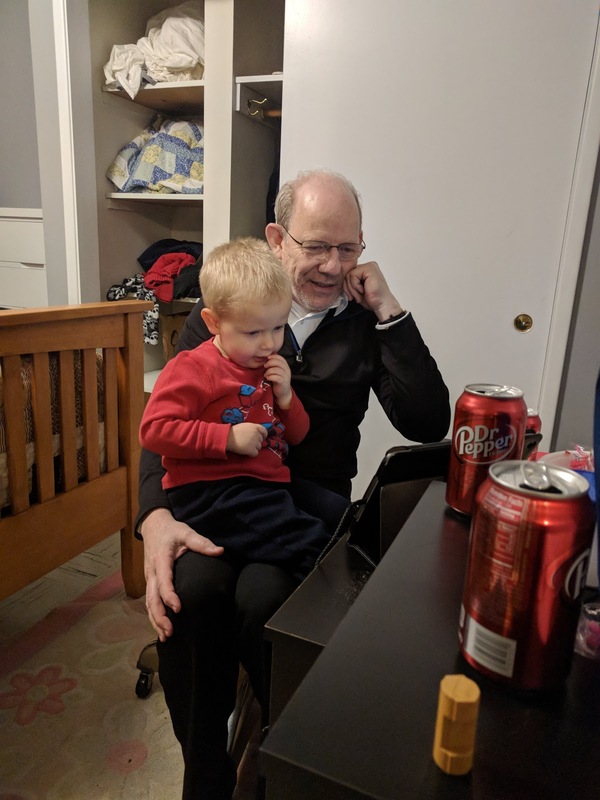 If Sammy went looking for Grandpa, and Grandpa didn't materialize, Sammy would bring his toys and play in front of Grandpa's bedroom door so that he wouldn't miss an opportunity to strong arm Grandpa into more snuggles. It must be so rough being the youngest grandchild. 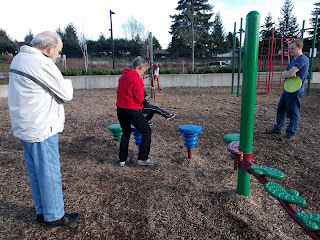 The kids introduced Grandma to one or two of their favorite games. Sammy manipulated Grandma into stories past bedtime. Monday morning was sunny and warmish. 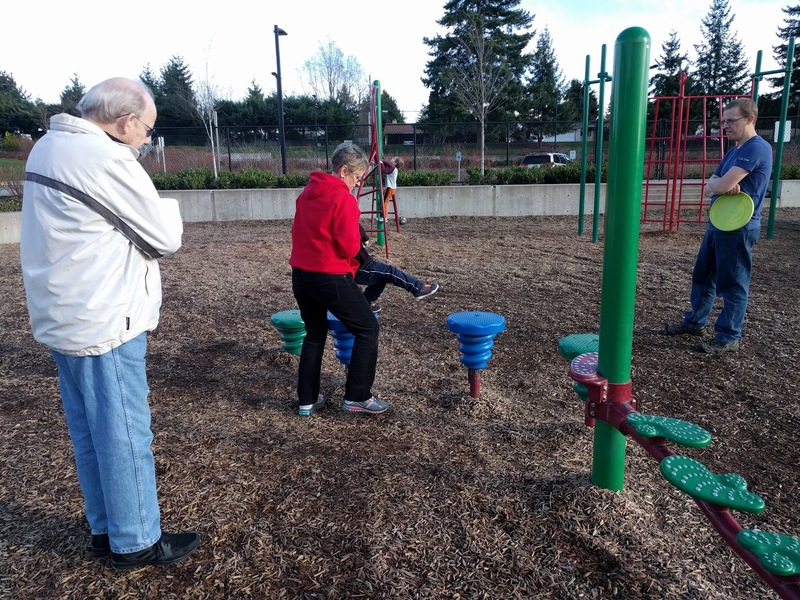 Grandma and Grandpa never abandoned their jackets like the rest of us did, but it was warm enough for them to tolerate a park visit. Jared requested that we go to the elementary school playground so that he could play "states" with Eloise on the big map of the United States. This is a game that I play with Eloise and B while Jared is in class. It's pretty simple. Someone calls out the name of a state, and everyone has to run there. 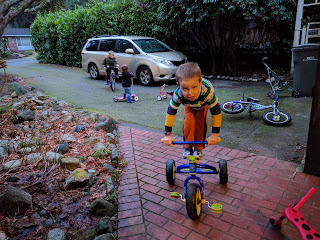 Learning + exercise = my formula for homeschooling active boys. 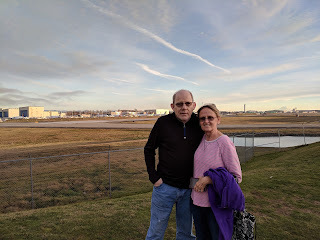 The last thing we got to do with Grandma and Grandpa before they went home on Tuesday morning was have family home evening. B taught the lesson about Samuel the Lamanite, a prophet from the Book of Mormon who prophesied about the coming of Jesus Christ. When he wasn't allowed into the city, he stood on the city wall. When the angry mobs shot arrows at him, none of them hit him. Eventually, when he had declared his message, he fled home to his own people. 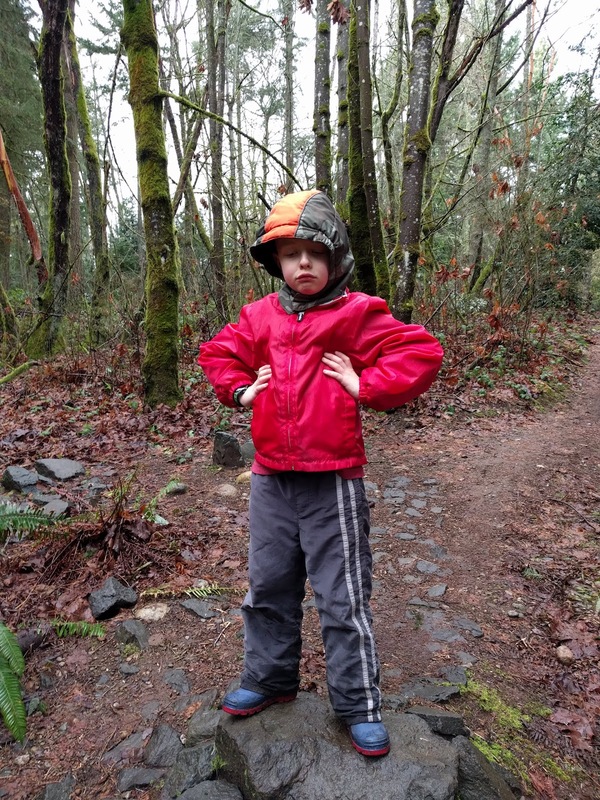 B was Samuel, and the rest of us were the angry wicked crowds throwing felt snowballs instead of arrows. After the lesson, we had a full blown snowball fight to get everyone nice and wound up before bed. 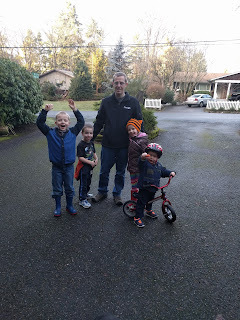 Then we reluctantly said goodbye to Grandma and Grandpa. On Wednesday, with everyone healthy, and the guest beds finally vacated for the first time in two months, it was time for demolition. 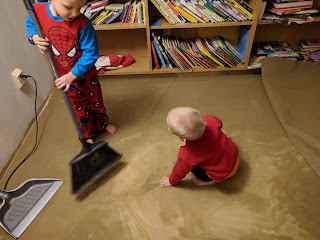 We pulled up the carpet in the library and discovered that a lot of the ancient carpet pad underneath had turned to sand. Sammy thought that this was the greatest thing ever. He was disappointed when we swept up the sand, but the rest of the pad has been disintegrating as we scrape it off of the floor, so there has been plenty more sand. Eloise loves scraping this stuff up. This project is about halfway through. I'll post pictures of the floor when we are done uncovering it. I'm looking forward to getting new carpet in the house. 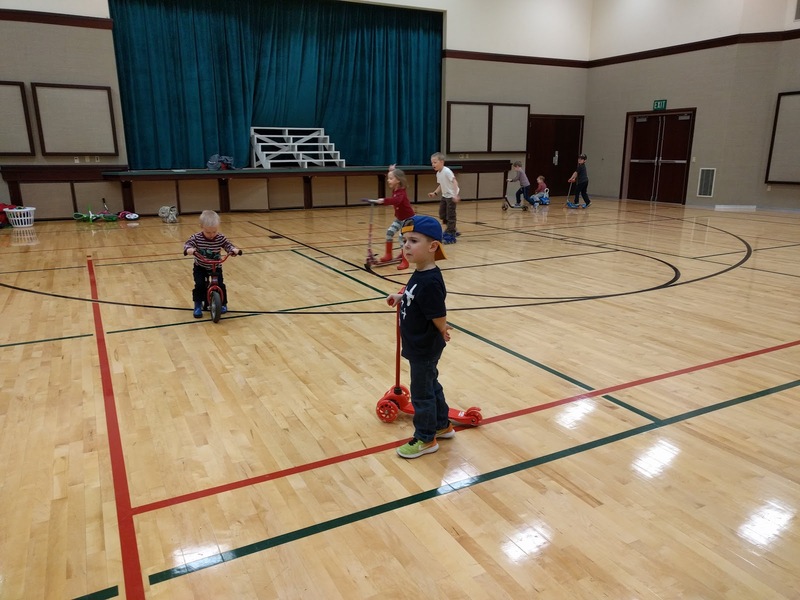 Some friends invited us to a playdate in the church gym on Thursday, so we went there right after Jared's PE class. This was great. 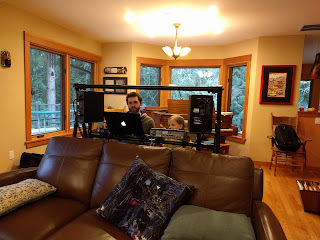 We had plenty of room to run and play for a couple of hours. After a picnic lunch at the church, we went to see a free dress rehearsal of Pinocchio at Studio East in Kirkland. 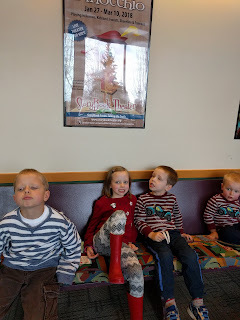 I didn't take our play picture until after the performance, and the kids were Tired. My favorite part of the play was the moment when Pinocchio was interacting with the audience after he had been swindled by a pair of conniving cats. I heard Jared, sitting a few rows in front of us with his friend Dorothy, say, "You were so foolish!" Pinocchio answered, "You're right. I was foolish." The prop work (growing his nose with magnets) was clever, but it wasn't my favorite children's play that we have seen there. Thursday afternoon was supposed to be book club for Jared and Eloise at the Redmond library, but the librarian got the flu and cancelled. 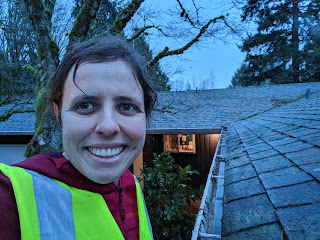 Since I found myself with some unscheduled time, and a house full of tired kids, I decided to unclog the gutters that have been overflowing all over our porch for a month. Of course, almost as soon as I got up on the ladder it started to hail, but I stuck with it, and the porch is finally dry. 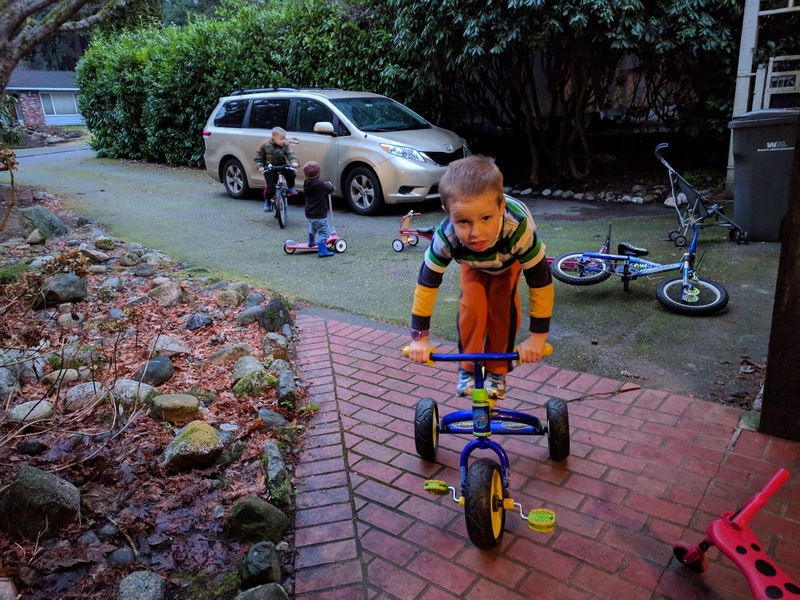 If you look closely at the picture you can see Sammy, still wearing his helmet from bike riding, watching in the kitchen window where he went to flee the hail. On Friday we went to the temple. I didn't want to stop and take pictures while we were outside, but Jared got the phone and took a couple of kid selfies. This is the best we got. 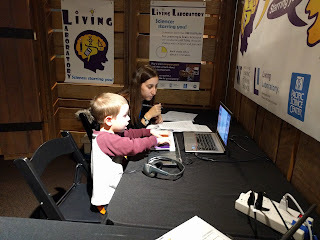 On Saturday morning Jared took a test in Redmond for the Lake Washington School District highly capable program. 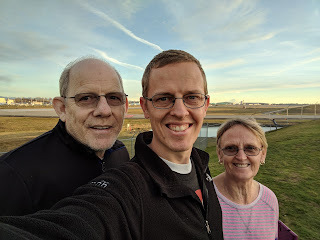 We checked him in for the test, and then drove to Sammamish to drop me off for my first ever half marathon! It was the Frost Eagle Half Marathon put on by Northwest Trail Runs. When I was reviewing the course map the night before the race I read the course description and saw that the race was on "technical single track," and I knew I was in for it. Technical single track means 13.1 miles of jumping over roots and slipping in mud, since it has been raining all week. Sure enough, I ended the race with very wet feet. 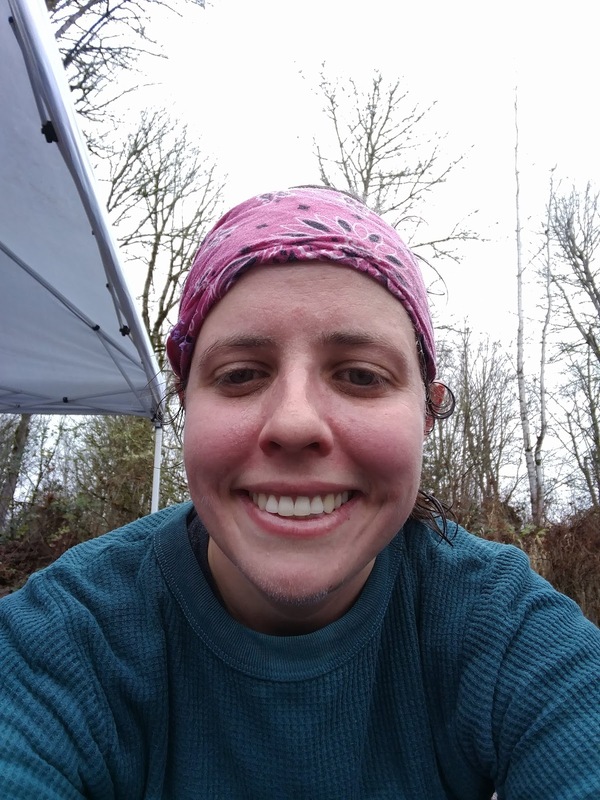 The race was a two lap race, and on the second lap, one of the puddles I had been able to dart around the first time without getting wet didn't have a path around anymore because too many feet had been through it. My goal was to finish before the course closed at 12:30, three and a half hours after the race start. I managed it in 2 hours and 45 minutes, so I met my goal! There was always the possibility that I wouldn't finish, since I had never run this distance, and I had especially never run this distance on trails before, so I'm proud of myself. Now I have to decide what to run next. At the turn of the year, the weather warmed up a little bit. 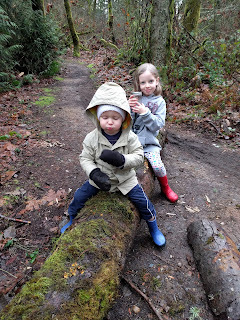 We managed to get outside, since this winter hasn't been as rainy as last winter. B took the camera to take a picture of our Christmas lights (miraculously back from the dead after shorting out last year). Jared photobombed his picture. I found out from a homeschool group that I participate in that the Seattle Symphony does side by side concerts with high school band and orchestra groups. They perform these in Benaroya Hall, the home stage of the symphony, but they don't charge for entry. 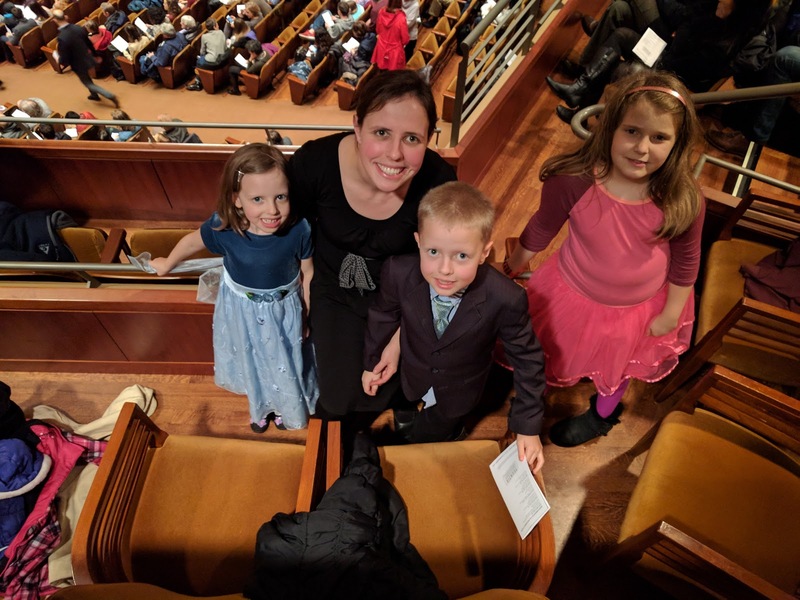 One of these happened on January 5, so I took Jared and Eloise to their first symphony concert. We may have been a little bit overdressed for a Seattle event. Lots of people stopped us to tell Eloise how much they loved her dress, and someone chased us all of the way across the lobby to tell Jared that he looks great in his suit. At our parking garage, someone asked us if we were coming from a wedding. 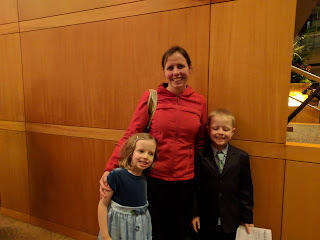 I thought we looked perfect for a special evening at the symphony. We ran into our friends, the Carvers, at the symphony. They were having a family date. 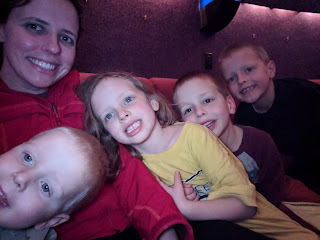 We sat up in this box, which was good, since the kids were getting tired, and a little restless. The concert ran right into bedtime. They were great, though. We had a good time identifying the different instruments. There was a high school flute soloist playing a concerto, and she looked like a princess. All of the little girls were riveted by her performance. The last piece had cymbals, which kept us wide awake. Grandma and Grandpa Knight sent these matching outfits for Christmas. These boys loved them so much that they have worn them every day that they are clean, but the sixth of January was the first time they managed to get them on at the same time. Eloise, who is a big fan of Calvin and Hobbes, draws cartoons for us almost every day. I particularly love this one. She makes good use of "Twisted Space Frog." 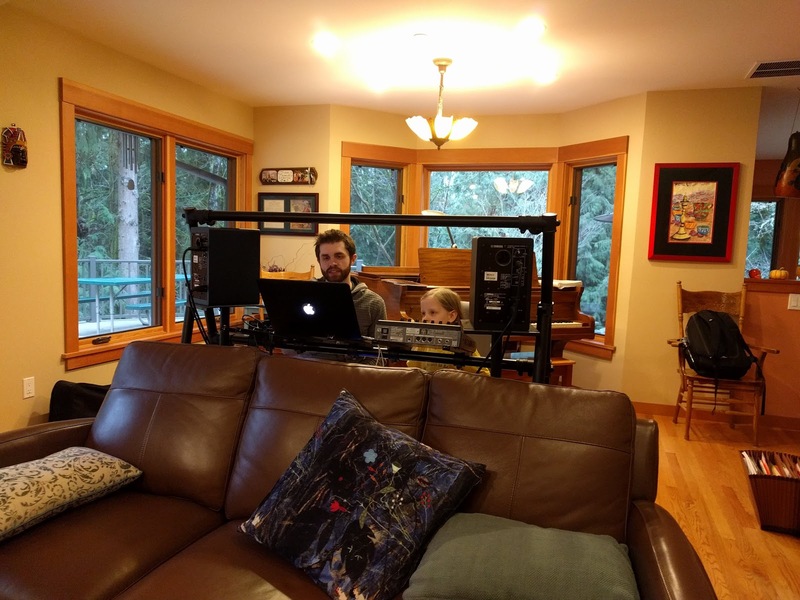 The kids were excited to start piano lessons again after the holidays/illness break. Piano teacher Sam is also Jared's primary teacher at church this year, which Jared likes a lot. We bought our membership at the Pacific Science Center on January 10 last year, so we hurried to do what we thought was our last visit to the science center on January 9. Fortunately our membership goes to the end of the month. 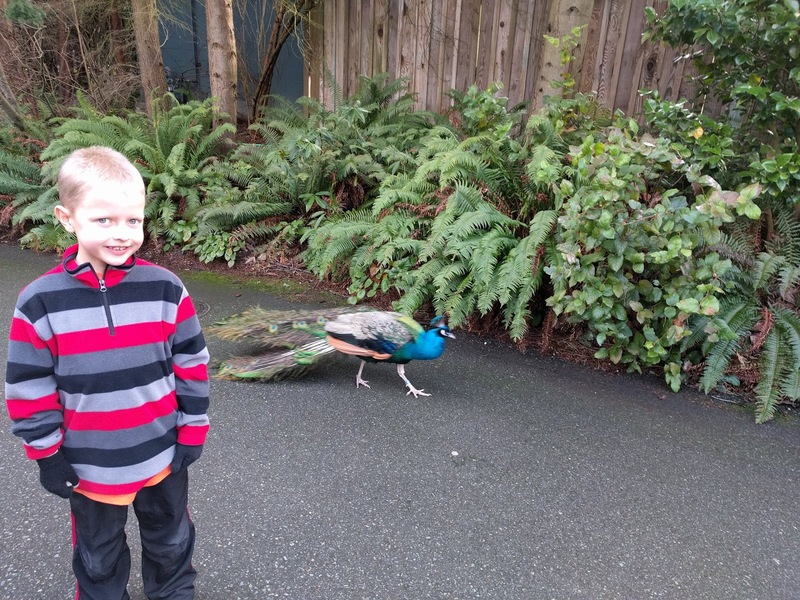 This is good because we didn't get to see Sammy's favorite exhibit, the bugs, on this visit. The kids learned about dinosaurs at science class this week. Even though Todd has virtual reality at home, these kids can't get enough. 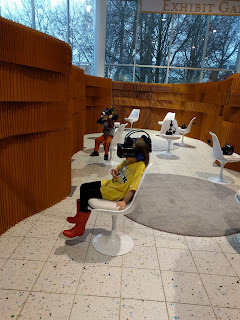 They watched this virtual reality underwater tour. Sammy wasn't old enough, so we watched. I don't know why, but the Knight kids are nuts about University of Washington research. Maybe I should tell them that they won't get reduced tuition in a few years for spending so much time getting their brains analyzed for research. There was a research post set up with a test to gather data on when kids develop perceptions of gender bias in math. B said that boys like math more than girls, but I think he said that because he is a boy who likes math. 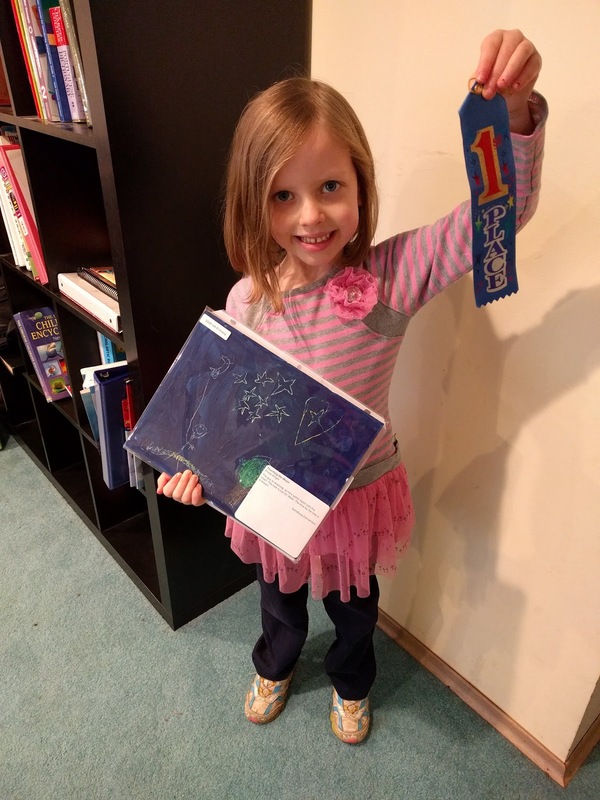 The other kids said that boys and girls like math the same. 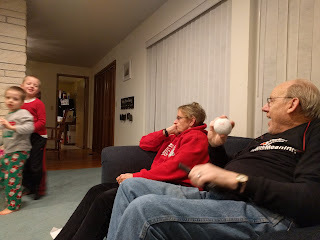 On January 10, Grandma and Grandpa Knight came from Arizona! They brought Christmas presents, and they are just about the best things ever. 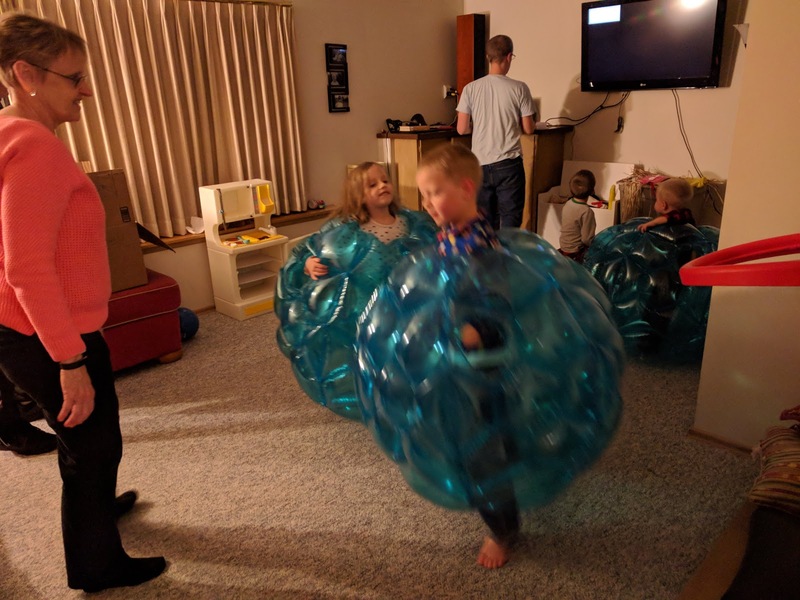 These boys throw themselves against each other even when they don't have a giant bubble to protect them, but the bubbles make it more fun. 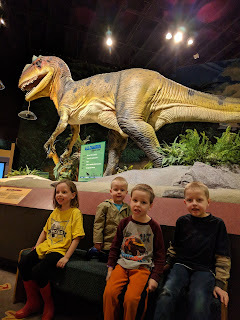 Since we still have the membership, and it was too cold to take Grandma and Grandpa to the zoo (Arizona has made them temperature fragile), we went back to the science center. We have used up all of our guest passes, but the admissions guy let Grandma and Grandpa in for free anyway! This time we spent time with Sammy's favorite exhibits. This iguana really wanted to get out of its box. 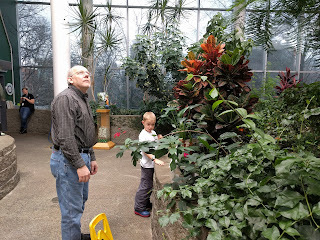 Since it is over 80 degrees in the butterfly room, Grandma and Grandpa were happy to get in and thaw. The rest of us quickly overheated and headed off to watch a live science demonstration about combustion. 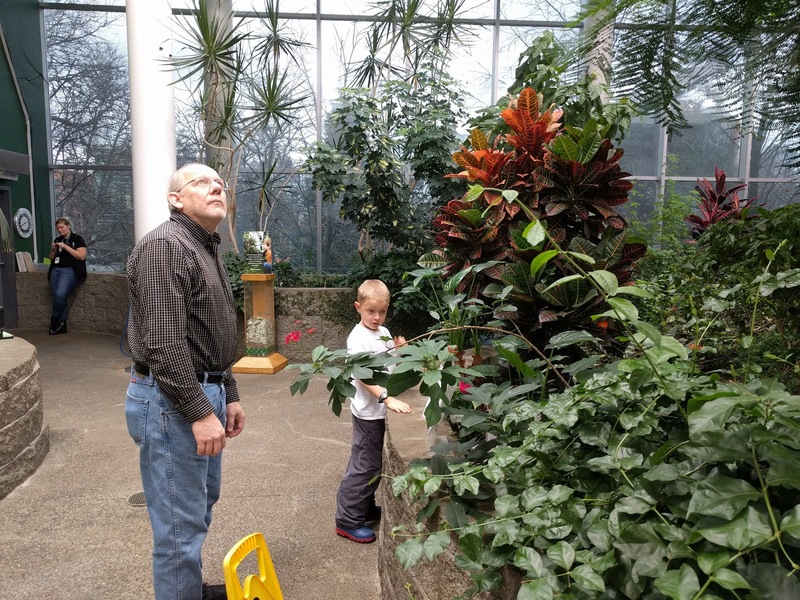 We love sharing our favorite places with Grandma and Grandpa, and we are happy that Grandpa is healthy enough to see the things he wants to see. Jared is about to start a recorder unit in his music class at the elementary school. I had a recorder from my own fourth grade recorder unit, but the flimsy plastic cover it came with is toast, so Jared and I made this case for him to take his recorder to school. I didn't even use an online tutorial, and it came out exactly as I had imagined. 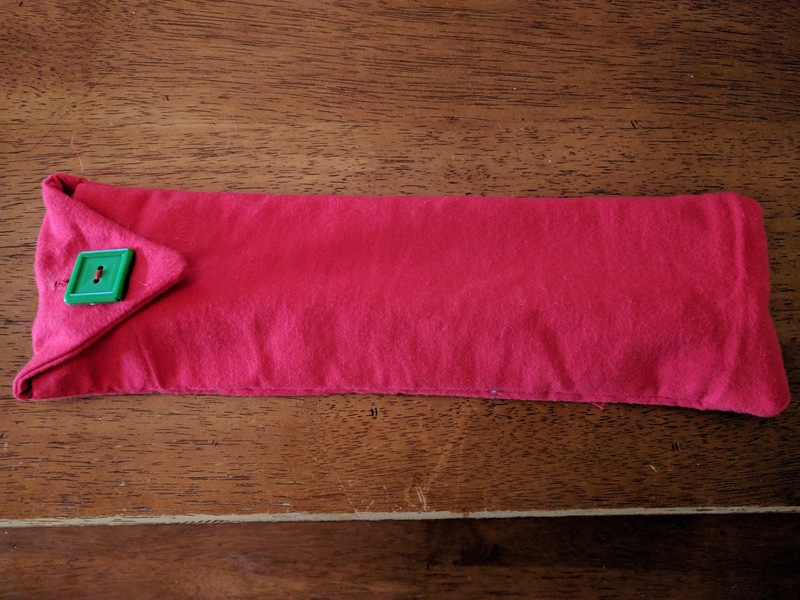 This was my first time using the buttonhole feature on my sewing machine. Grandpa wanted to tour Boeing. The tour isn't child friendly (you have to be four feet tall to participate), so Todd had a date with his mom and dad. 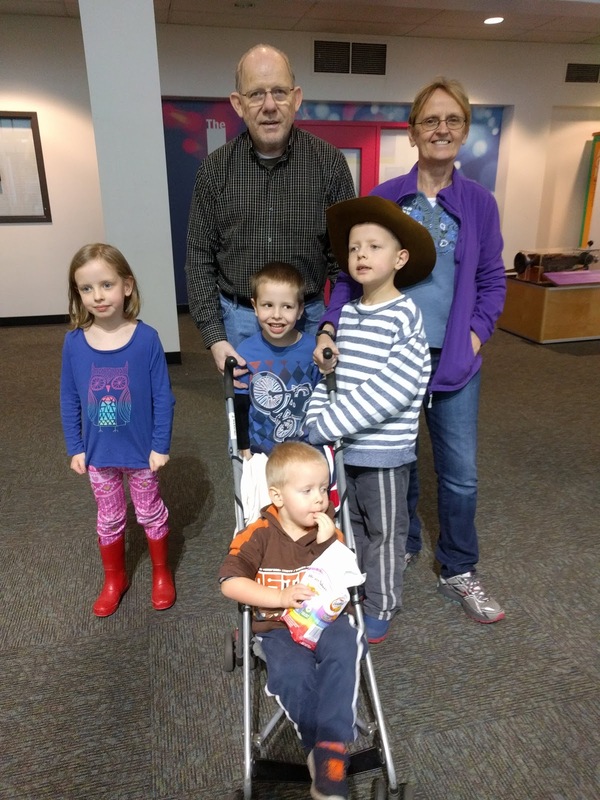 We are so glad to have Grandma and Grandpa Knight here to visit! This is a great start to the year. December's here, where's the Christmas cheer?